Although I mostly work in colored pencil these day, I love to push around drawing sticks of various natures. 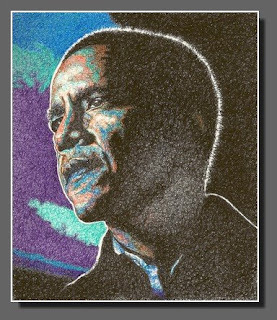 This Obama drawing was done with a set of Primsacolor Fine Line Markers. It’s a scribble drawing of mostly circles and figure eights to build layers of ink. No hatch lines in this sketch, just curve doodles. Obama is going to be a fun political figure to sketch, he has a great face. 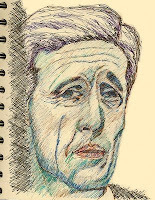 Just for yucks, I’ve pulled out a sketchbook from 2004 with a couple sketches I did during that presidential campaign. These were done with Micron Pens and lots of loose hatch lines. It’s a much faster sketching method and definitely looks very much like sketching. Of course, this is five years later and I don’t do everything the same way I did then. I still use cross-hatching for faster sketches, but I do lots more these days with circle type scribbles. It’s most likely a rub-off from working with colored pencil. I do lots and lots of tiny circles with colored pencils to build layers of color. And I’ve discovered that the technique can work nicely with ink pens as well. So artists, grab your pens and sketch away. No erasers allowed, just move those writing sticks around. The portrait of Obama with the fine line markers is fantastic! I love the technique, and you’ve captured him perfectly. I think it should be an official portrait, or win an award, at least. LOLOLOL Thank you so much, Holly. I love drawing him, he has a great face. I’m doing more portraits of him in this style cause it’s fun. Thanks! Thanks for stopping by Claudia. Nice to have you reading!